Following the opening of boho-chic Brasserie Barbès, Paris bar magnate Pierre Moussié follows suit with his first hotel venture. Around the corner from the theatres of Grands Boulevards and trendy Strasbourg Saint-Denis, the property - an English-hunting-lodge-meets-Parisian-abode - stands on a refreshingly forgotten square of the city, adjacent to the whimsical Petit Saint Martin Theatre’s prop entrance. Varying in shape and size, the 18 rooms of the 1854 Haussmannien building have been individually decorated, like the rest of his establishments, by Mr Moussié, this time with his wife Elodie and friend Sophie Richard. 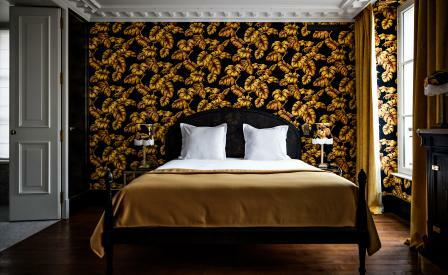 Most come wholly lined with audaciously patterned velvet House of Hackney wallpapers like pocket-sized number 31, which has a bold red Kilim tapestry, while the spacious penthouse suite, which enjoys Sacré Coeur vistas, has a leafy green motif. Marble fireplaces and oak floors, 70s rattan chairs, oversized brass solitaire coffee-tables, Art Deco lighting fixtures and flea market finds like Victorian portraits, along with custom-made bars as well as all you need to shake your own cocktail, come together in a wonderfully warm, evocative hushed ambience. Lined by an attractive terrace, the muted ground-floor speakeasy style brasserie serves grilled, marinated, or raw, meat and fish alongside the wintry romance of an English countryside inn.